I've had the new iMac G5 for a bit over a week now, and I'm still really happy with it. It's a really beautifully designed computer, with all the usual Apple attention to detail. When I compare it to our old CRT-iMac (a Graphite model), you can see how they've continued to advance the all-in-one computer concept right to its logical conclusion. It's so sleek and integrated. Two little touches that exemplify this are the power cable which has a plastic disc attached to the socket end so that the cable forms a smooth, continuous surface with the back of the machine, and the IR sensor (for the remote) which is hidden invisibly behind the grey Apple logo. When the first iteration of this style of iMac came out, I didn't like it very much, but this one is much less boxy and quite a delight in the flesh. Err, plastic. Cooling is very cleverly handled with the slot-like grill near the top of the back of the machine, and it's very quiet or nearly silent in normal use. The speakers are also very neat, and fire downwards from the bottom edge of the computer. I was sceptical about the sound quality that would result from this arrangement, but I must say that I've been pleasantly surprised. The real stand-out feature of the iMac G5 is the screen. I'm very glad now that I got the 20" model, because the screen is superb. It's bright, very clear and sharp and viewable from a wide range of angles. 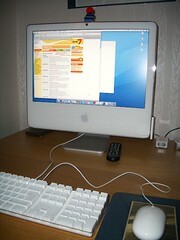 After my 12" PowerBook screen, it seems absolutely giant, and makes the poor PowerBook look tiny and dim in comparison. One of the first things I had to do when I set the iMac up was to speed up the mouse tracking, because moving the mouse from one side of the screen to the other seemed like a hike of a couple of days. Using Aperture on this machine is a joy (more on Aperture later), and it's made me enjoy my photographs all over again. Some of them look so nice on the big screen that I've started to think that I am actually capable of occasionally taking a decent photo. I've played a little bit with the built-in iSight camera and Photo Booth. Harkening back to the days of messing around with your sweetie in a photo kiosk, Mr. Bsag sat on my lap in front of the computer and we grinned cheesily while waiting for the countdown. I'm not sure if I'll use it much for video conferencing, but it's nice to have it built-in and ready if you do need it. Front Row and the remote control are also wonderful, and very useful when you're giving a photo slideshow to your parents in a tiny computer room, and need to advance the images without getting your big head in the way. The iMac feels really nippy (blazing, compared to the old iMac, which has to think about anything for a while before responding), and the extra 1 GB of RAM I added probably helps quite a bit. I ended up buying the RAM from Crucial, as it was effectively half the price of getting an extra GB built-to-order from Apple. Thanks to the little trap door in the bottom edge of the iMac, it's very easy to add the extra stick yourself. Overall, I'm really happy with this machine. It's now serving as a media centre as well as a digital photo centre and a standard computer for Mr. Bsag. Our old iMac gave us sterling service for 5 years (and will continue to be used as a kind of 'dumb terminal' in Mr. Bsag's studio), and I've got every confidence that the new iMac will do the same.